Trivia: This movie was officially recognized by the Commission on the Bicentennial of the United States Constitution as a work "of exceptional merit"
Here’s a movie that always reminds me of the 4th of July. 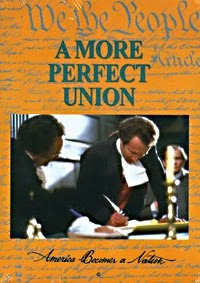 Produced by Brigham Young University, 1989’s A More Perfect Union (subtitled America Becomes a Nation) is a dramatic re-enactment of the Constitutional Convention of 1787, when delegates from the 13 states gathered in Philadelphia to hammer out the details of a new form of Government. Shot on-location in such historic sites as Philadelphia’s Convention Hall and Williamsburg, Virginia, A More Perfect Union is a well-acted period film that tackles a key moment in American History. The movie takes us back to the 1780’s, some 10 years after the American Revolution, when America, plagued by political corruption, Britain’s harsh trade regulations, and the failings of the Articles of Confederation (which established strong State Governments while giving very little power to a National one), was in turmoil. In an attempt to rescue the country from its current destructive course, Virginia’s James Madison (Craig Wasson) has devised a new form of Government that will give more power to a National Assembly while, at the same time, allowing the American people to be part of the process. Supported by such icons as George Washington (Michael McGuire) and Benjamin Franklin (Fredd Wayne), Madison’s plan is presented at the Convention of 1787 by Virginia’s Governor, Edmund Randolph (Bruce Newbold). Despite the fact many of the delegates were instructed by their State legislatures to maintain the status quo, most agree that America must change in order to survive, and, as their first act, abolish the Articles of Confederation, clearing the way for Madison’s plan to be presented for debate. Yet its passage is not guaranteed. The major sticking point of Madison’s outline for a new Government is the make-up of the two houses that will form the legislative branch, the bodies responsible for creating the laws of the land. As proposed by Madison, each state’s representation in the two houses will be determined by its population (under the Articles of Confederation, each state, whether big or small, had only a single voice in the National Assembly), meaning the larger states (like Pennsylvania and Virginia) will have more delegates, while the smaller, less populated states (like Delaware and Connecticut) will have fewer. As Madison sees it, the issue of proportionate representation is the most important of the Convention, and, if passed, will finally allow for a Government that represents the people’s interests, and not those of the States. Naturally, the idea of having less of a voice doesn’t sit well with the smaller states, who have threatened to walk out over this issue. In a last-ditch effort to save the Convention, Roger Sherman of Connecticut (H.E.D. Redford) proposes a compromise: representation in the lower house will be based on population, while the upper house (the Senate) will maintain the current practice of “one state, one vote”. But when the time comes to ratify this compromise, the larger states reject Sherman’s proposition, leading to a stalemate that will stretch on through most of the summer. This debate between the small and large states gives A More Perfect Union its dramatic center, and even though the majority of the film takes place on one set, and is (as expected) dialogue heavy, it remains an intriguing motion picture. With its cast of character actors and relative unknowns (save Craig Wasson, who appeared in movies like Ghost Story and The Boys in Company C), A More Perfect Union takes us deep into the issues that plagued the Convention while also presenting the viewpoints and opinions of both sides of the argument. Madison, as well as other “Nationalists” like Alexander Hamilton (Derryl Yeager), and Pennsylvania’s James Wilson (James Walsh), believe the people of America must have a say in their government, which would only be possible through proportionate representation in the legislative branch’s upper and lower houses. Yet the delegates from the smaller states, like Roger Sherman and Delaware’s John Dickinson (Jesse Bennett), have no intention of allowing this to happen, fearing that the larger states will then use this advantage to push through their agendas. A More Perfect Union dedicates a fair portion of its running time to this issue, exploring it in remarkable detail. An absorbing recreation of a key moment in U.S. History, A More Perfect Union is as fascinating as it is educational.